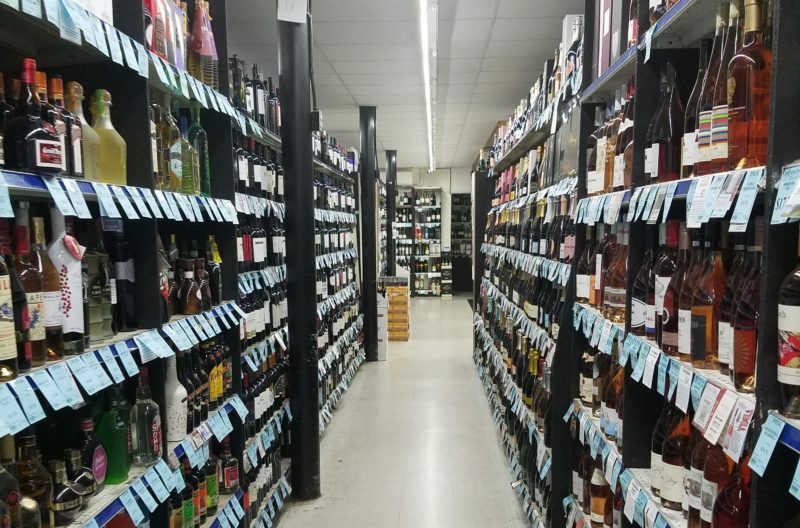 For Hawaii visitors looking to find the kind of food and drink that can be considered truly “local”, look no further than Tamura’s Fine Wine & Liquors. Certainly, Hawaii offers countless bars, bistros, brew pubs, and boutique eateries to choose from on each island. In recent years Hawaii has seen an explosion of new establishments catering to all manner of cultured tastes. Virtually all are worth considering. But Tamura’s is a sure-fire option if you are looking for the kind of place that locals count on regularly. 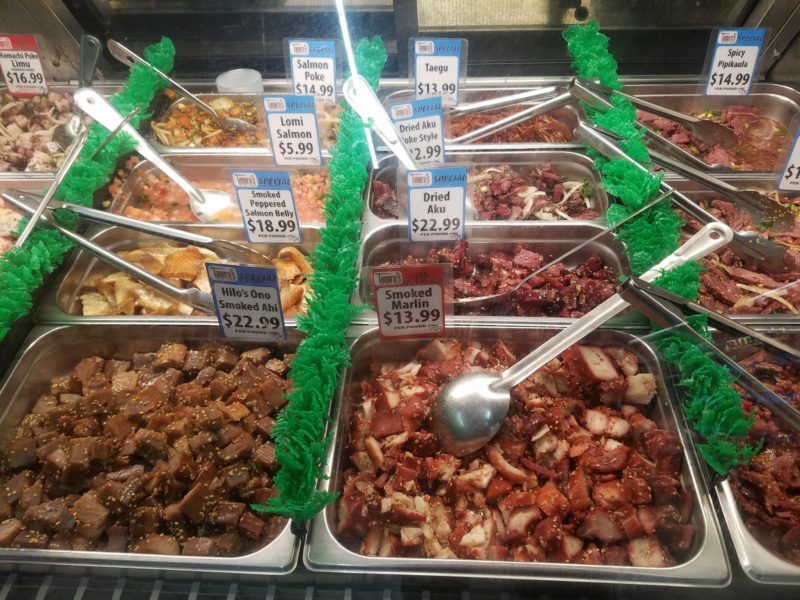 Tamura’s has multiple locations on Oahu and Maui. Tamura’s is not a restaurant. Rather, it is a purveyor of the fine wines and liquors in its name. But a large portion of the business it does is at it’s poke (“po-kay”) counter. Its fresh fish preparations are second to none. The Tamura’s special soy sauce (“shoyu”) based marinade is variously and accurately described as “magical”, “unreal”, and of course, “broke da mouth”. From the Hawaiian Style Ahi poke, with salty and savory limu (seaweed) and Hawaiian rock salt, to its Shoyu Tako (octopus), Tamura’s beckons local families looking to bring tasty snacks to family and community gatherings. All of Tamura’s locations see a marked increase in business on the weekends. Little League potlucks, weddings, retirement and birthday celebrations happen. Tamura’s answers the call. The seafood preparations are fresh. Previously-frozen selections are always clearly indicated. Just one aisle of Tamura's fine wine selection. For those with an aversion to raw fish preparations, Tamura’s also offers a delectable variety of dried and smoked fish. For any lover of seafood, the smoked marlin that Tamura’s offers is a must. Other favorites include clams, squid, and scallops. Tamura’s could be accurately described as a specialty grocer. It offers various rare smoked deli meats and cheeses from around the world. Many of the gourmet foods can be found at places like Whole Foods or Safeway, but local families prefer to keep it local. The “Fine Wine & Liquors” in the Tamura’s brand name exists for a very good reason. Tamura’s offers a selection of wine and spirits as fine as any purveyor in all of Hawaii. 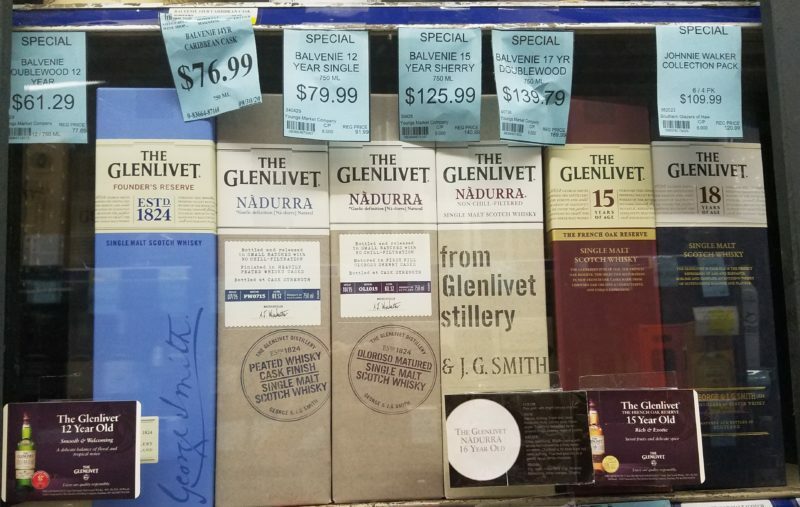 A rare, single malt scotch from the Scottish hinterlands? Tamura’s has it. A boutique Shiraz from a tiny California vinter? They have that, too. The beer selection would delight any brewed-beverage enthusiast. Tamura’s is beloved by locals because if they don’t have it at any of their locations, they’ll order it for you. Again, we like to keep it local here. And yes, domestic favorites are always on hand for the Coors Light and Budweiser crowd. Tamura’s also has a wide selection of fine cigar and other tobacco products (it’s up to you to find a suitable place to enjoy them). It’s not the place to go if you’re looking for a loaf of bread and some processed cheese food. The inventory at Tamura’s is carefully and expertly curated. A small sample of the fine spirits on offer at Tamura's. In that respect, Tamura’s shines as part high-end wine, beer and spirits purveyor and part corner fresh fish and poke store. It’s not the kind of place you’d go to for stocking the family fridge for the week. But it holds a special place to go if you’re looking to find the kind of things local families bring to important, food-and-drink centered gatherings. If you are visiting Hawaii and are fortunate enough to be invited such a potluck occasion (they are all potluck), you can’t go wrong at Tamura’s. If you just want to eat and drink like a local, Tamura’s Fine Wine and Liquors is a sure thing. More of Tamura's many fresh fish selections.